Bunibon 2 is now available on the AppStore and Google Play! It was released on Ouya earlier this month. This sequel continues where the first installment left off – at insane difficulty. Then it ramps it up. With online highscores across all three platforms, that you can also see on the web! 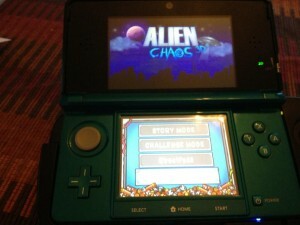 Like a fine vintage wine, our game Alien Chaos 3D (first called ‘Really Shooter’, then ‘Mama & Son’, then ‘Clean House 3D’) has finally been released on the 3DS eShop – in Europe. It was finished in 2011 and it’s been through some adventures between then and now, but here we finally are! If you’re wondering what the hell this game is about, well, it’s mostly about destroying robots and cleaning up afterwards. It’s more fun than it sounds, and it also has one of the best uses of StreetPass of any 3DS game (certainly by the time of its completion anyway)! Check it out, it’s only €4! It was way back around Christmas 2011 we started talking with Paradox and Arrowhead about making “iMagicka” for tablets, and production started just a month later. Now, 1000 puns and a million lines of code later (probably, I don’t know..) we have finally released it to the world! It feels incredible to see it out in the wild, play with other players and read the reviews. We’re not done with the game, there is alot of extra content planned for, and extra platforms to consider. But we’ll announce those as we go. Stay tuned for that! Going forward, it looks like 2013 is going to our best year yet. Ittle Dew has been put in the corner for way too long and it’s now being wrapped up (for realz this time) and is really closed to being finished. We want to release it pretty much everywhere – PC, consoles, touchdevices. We’re gonna give Ouya a try also. We’ve already published Regnslöja’s Bunibon 2 there, and we intend to have a total of 6 titles on there before the end of the year. Not all are our own games, we have some great indie classics in the pipe too! This is probably way too much info and announcements for one blog post, so I’ll stop now (there is more..)!